There is little question that today’s latent print community faces unprecedented challenges. From increased calls for changing existing processes and procedures (while maintaining existing case loads) to simultaneously meeting the evolving requirements to greatly improve documentation, latent print departments are under extreme pressure— pressure that lies on top of the ongoing realities of tight budgets and the need to recruit and retain superior talent. At the same time, one of the greatest issues facing our industry is the heightened scrutiny—from multiple and various parties — of latent print actions and practices. More than ever before, there is need for meeting transparency concerns, while improving efficiency, accuracy, and consistency in the casework performed by latent examiners. As part of any department’s overall strategy, an Electronic Latent Case Management System (e-LCMS) can play a vital role in addressing these issues. With staff increasingly required to do more with less, the ability to access information quickly and efficiently — without digging through stacks of paper or cabinets full of folders — becomes paramount. Consider this: with an e-LCMS, all case information (images, case notes, worksheets, reports) is stored on a central server and easily accessed from any computer on the network. In addition to improving accessibility, an e-LCMS streamlines workflow and moves the office toward the greater efficiencies of a paperless process. No more having to locate misplaced file folders or worry about incomplete data. Further, an e-LCMS includes a secure image/photo management system (with full audit trail), eliminating the need to copy CDs or DVDs. All information relevant to a case can be immediately retrieved by an examiner for case review, onscreen comparison, and verification. A well-designed e-LCMS puts the tools to simplify increasingly complex and evolving documentation requirements in the hands of those who need it. Using intuitive data fields, the e-LCMS walks an examiner step-by-step through the detailed documentation process (evidence processing, latent analysis, AFIS, comparison, verification). At the same time, the e-LCMS matches SWGFAST (Scientific Working Group on Friction Ridge Analysis) current best practice recommendations for the latent print community. Equally important, a good e-LCMS can be adapted as new requirements and recommendations (i.e., Office of Scientific Area Committees — Friction Ridge Subcommittee) are released. It’s tough to argue with the notion that “the best defense is a good offense.” Being confident that processes, case notes, and all related case documentation are consistent and easily accessible provides a valuable platform for success and supports transparency. In addition, an e-LCMS encourages uniformity of information by allowing agency-specific terminology to be built into all processes, which eliminates the variations of style and terminology in case notes that are typical from examiner to examiner. Accuracy and consistency are also enhanced by consistent formatting of all output. Information is only as good as the ability to access it easily and quickly. 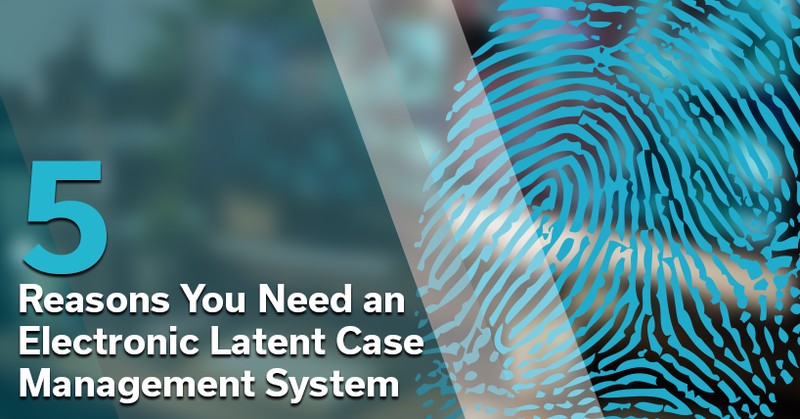 An e-LCMS provides this ability both internally and externally, by authorizing access to specific case information for users outside the latent department. Additionally, a well-designed e-LCMS provides remote access to parties involved in the case, such as other agencies or the offices of the district attorney. Accreditation is an important reality, and increasingly valuable in this era of unprecedented public scrutiny. By its nature, an e-LCMS supports objectives for either receiving or maintaining ISO/IEC 17025 or 17020 accreditation — a significant attribute considering latent prints analysis stands as the most complicated analytical process found in the forensic environment. Assuming a strong design, an e-LCMS provides the infrastructure to standardize all case interactions, making it easy to determine how the process is performing at any point, and automatically tracking all case activity so that an audit trail exists for updates and/or changes. Longer term, an e-LCMS provides a dynamic platform that adapts as requirements continue to evolve. While the challenges that lie ahead of the law enforcement world are momentous, ours is an industry that faces things head on. E-LCMS provides important efficiencies and stellar accuracy, and the systems help support the important work to be done nationwide. To learn more about how an e-LCMS can benefit your organization, read about LatentWorks.